On September 17, 2011, the Occupy Wall Street movement exploded onto the scene. Peaceful protestors set up tents and sleeping bags in New York City’s Zuccotti Park. The movement’s slogan was “We are the 99 percent.” Protestors railed against big banks, the growing foreclosure scandal, and political corruption. Five years later, the Occupy movement finally has the leader it never really had: Bernie Sanders. In the years since the movement was squelched by a chillingly multi-pronged alliance between various U.S. government agencies and private enterprise, resentment toward those who retain a chokehold on power and money has simmered just below the surface, ready to boil over. Enter Bernie Sanders, who has been widely embraced by those hungry for substantial change, unsatiated by simple platitudes. Did Occupy really fuel the fire of Sanders’ popularity? I asked asked members of various Bernie Sanders Facebook groups for their opinions. Approximately 20 people answered the question of whether Occupy Wall Street helped influence the election by making voters more ready to hear Bernie Sanders’ message. Most of those who answered believed that the Occupy Movement had at least some impact in helping propel Bernie into the spotlight. Only three people did not believe the movement influenced his popularity at all. While some folks believed that Occupy didn’t change anything substantially in terms of government and policy, they did believe that it made the public more amenable to his message. 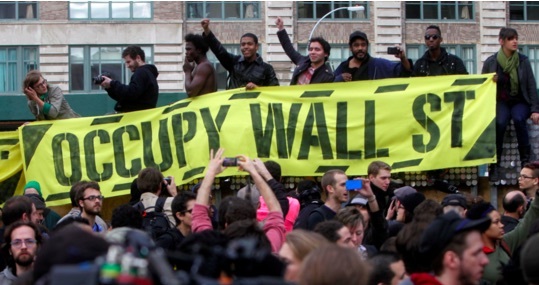 What is the future of the Occupy Wall Street movement? A December 2012, investigative story in The Guardian provided an Orwellian view of what happened with Occupy. In the first paragraph of Naomi Wolf’s piece, she reveals that the FBI, Department of Homeland Security, and local police coordinated together to crush the movement. What’s worse, the very banks the movement was protesting against were also behind it. The well-oiled coordination between multiple agencies and businesses are exactly the kind of corruption Sanders has rallied against since he protested against racial segregation in the 1960s. And he continues to battle the machine, only this time, it’s corporate media outlets, chiefly, CNN, whose parent company, Time Warner, is one of Hillary Clinton’s top donors. Sanders has also had to battle the Democratic National Committee and Debbie Wasserman-Schultz, who not long ago told a news outlet the purpose for superdelegates was to prevent grassroots candidates from winning elections. Bernie Sanders, is a grassroots candidate, but he’s become a powerhouse the likes of which the DNC can’t ignore. His most recent rallies in Utah and Arizona attracted tens of thousands of supporters waiting to hear his speeches. And Bernie might not have gotten very far if not for the attention Occupy brought to the very issues Sanders has held close to his heart since he chained himself to a young Black woman back in 1962. Whereas the Occupy Movement lacked real leadership and cohesion, Bernie Sanders has essentially stepped forward to become the defunct movement’s de facto leader through his presidential campaign. Part of his appeal is that he hasn’t usurped the public sentiment against corruption in government and big business. Rather, his appeal stems from the fact that he has worked toward the very things the Occupy Movement symbolized: economic equality, racial equality, equality in educational access, immigration reform. The list goes on. For five years, the movement’s fire was dimmed, never quite flickering out. Last year, Bernie Sanders stepped up to the glowing embers, added kindling to the fire, and began speaking to the proverbial empty room. Slowly, one by one, voters heard his message. Eleven months later, neither the government, the big banks, nor billionaires can can stop the fire that Bernie Sanders stoked. Indeed, Bernie’s political revolution has his supporters feeling the Bern.